Archaeology Month is a national program to promote the preservation of our country’s heritage. 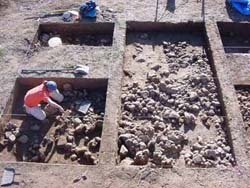 California Archaeology Month is sponsored by the SCA, observed in October to integrate with California’s kindergarten through Grade 12 curriculum on Native American and California history. Each year, the SCA publishes an Archaeology Month Poster using contributions from state and federal agencies and member donations, and also makes available a comprehensive Archaeology Month Resources Guide. The posters are distributed to local, state, and federal agencies and private entities to help promote the preservation of California’s archaeological heritage. Current and past posters are available for sale from the SCA Business Office. Imagine…for a moment that you have a 10,000-piece jigsaw puzzle – but no picture to tell you how it’s supposed to look. Then imagine that the puzzle was buried in your backyard many years ago by someone who lived in your house before you were born, and you’ve just dug it up again. The pieces are all scattered around; some of them have gotten wet and the picture is gone; others are caked with mud; many others have been eaten by gophers or carried away by kids digging in the dirt, never to be found again. Now take what’s left of the puzzle pieces into your kitchen, clean them off, count them (of the original 10,000, say there are 4,000 left), lay them all out on your table – and try to put the puzzle back together, to see what the picture was. Make Archaeology Month a Statewide celebration by having an event or activity in your county that highlights the fascinating things we learn from archaeology. Download this flier for more information. Ask your City Council or County Board of Supervisors (or both) to recognize October of each year as California Archaeology Month as part of a statewide effort to encourage respect, appreciation and a better understanding of California’s diverse cultural heritage. Annmarie can provide a draft of a mini-speech for you to present, and a draft resolution that you can provide to the board. Present each council or board member with a poster. To avoid duplicate efforts in one county, please tell Annmarie if you plan to talk to your city or county administrators. Create a display for a local library, school, a mall, town hall or other public forum. Is the poster you created for the SCA poster session — this year or last — usable? Help your local library display archaeology or California Heritage books. Please put any on–going events (visiting Speaker’s, open–houses) on the SCA Archaeology Month Calendar. Contact Annemarie Cox (760) 705-2852 to put an event on the Archaeology Month Calendar. If you have a question or comment or would like to put an event on the Archaeology Month Calendar, please contact Annemarie Cox. 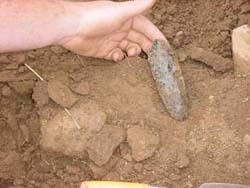 Complete the Archaeology Month Public Outreach Information Form. This will help the SCA track the amount of time spent on outreach efforts by members and also helps meet in-kind requirements for federal grants the SCA receives for Archaeology Month activities.